Do I have to leave the island to shop for groceries? I had the same question before I moved here . . . what is the food shopping like? I think folks worry we have a very limited supply of shopping options. In short, our options are many. 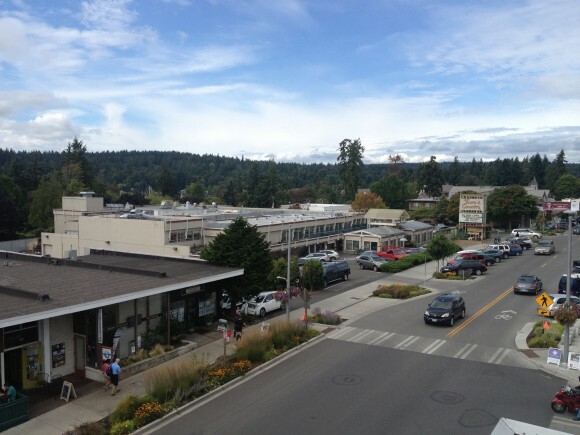 Looking down on Town & County Market on Winslow Way on Bainbridge Island. Safeway – Our largest chain grocery store. Located in Winslow in our only “strip mall” which also includes Rite Aid (large pharmacy), a dry cleaners, hair cutting shop, shoe store, florist, UPS Store, Frozen Yogurt, Subway, Mexican food, and more. Many people do their “big” shopping here. And they just completed a remodel as of September 2013. Town & Country Market – Known to locals as T&C. . . . it is our local chain market. A specialty, gourmet, market. It is smaller than Safeway, but has a larger selection of organic and locally sourced produce and seafood. Great bulk bins too. I love to refill my olive oil there and grind peanuts for fresh peanut butter. Many folks supplement what they buy at Safeway with produce and fish/meat from T&C. That said, some folks do all their shopping at T&C. Also popular for their coffee shop, salad bar, soups, fresh pre-packaged meals. T&C will embark on a remodel in 2014 to expand and update the store, but will remain in its current location next to the post-office in downtown Winslow. Click here for remodel photos. 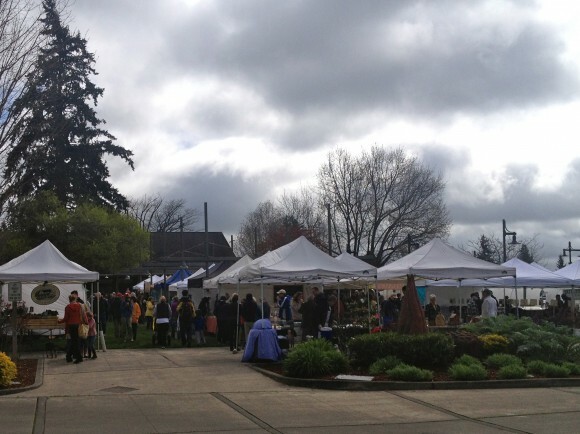 Farmer’s Market (April – December) – Held in the town square at city hall. 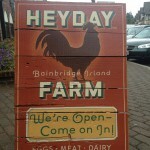 Great selection of seasonal produce, eggs, cheese, breads, honey. Also great food if you want to stop by and have lunch or breakfast at the market. I have key items I buy there almost every Saturday, like greens, cheese and flowers. Click here for a full list of local vendors. 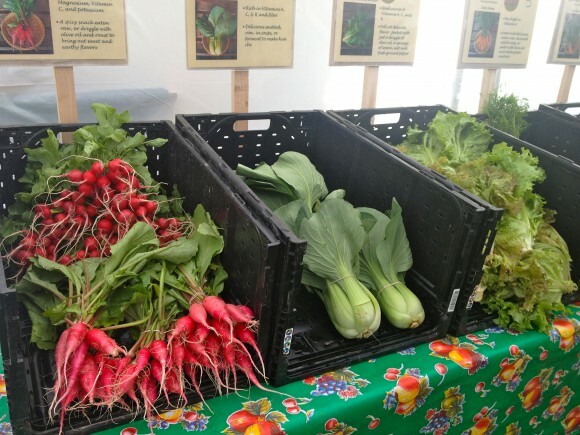 Local CSA’s – There are several CSA (Community Supported Agriculture) programs on the island and in the greater Kitsap area. For a full list, click here. 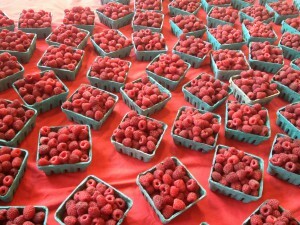 Raspberries from one of our local farms on Bainbridge Island. Hey Day Farm – A small market in Lynwood Center selling locally grown vegetables, red meat, chicken, pork and eggs. The farm is on the south end of the island. You can subscribe to various plans and pick up your items at the Lynwood Center Store. Open 24 hours to subscribers, who can key in with a code. Delivery from Spud – Several folks I know order from SPUD – Sustainable Produce Urban Delivery – a Seattle based grocery delivery service. You can order on-line and they deliver to the island. Farmer’s Market Bounty on Bainbridge Island. Central Market -Central Market is owned by the same company that owns the Town & Country Market on the island. Central Market is much larger. Feels and looks a lot like Whole Foods (if you want Whole Foods you will have to go to downtown Seattle to shop, Belltown being about the closest). Some folks make the short drive to Poulsbo and do all their shopping at Central Market. They have a large selection of seafood, produce, cheeses. Terrific bakery and extensive to-go food: salad bar, soups, fresh pre-packaged meals. This center is home to a Stella’s Pizza and a handful of other stores. Wal-Mart – For one-stop discount shopping, Wal-Mart is in the College Market Place Shopping Center near Home Depot, Big 5, and PetCo. They have groceries at this Wal-Mart too. In this shopping complex there are also restaurants, Starbucks, shoes stores, etc. 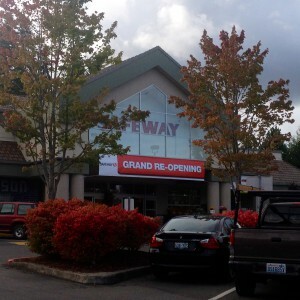 Another Safeway – A brand new Safeway opened in 2015 right off Highway 305 in Poulsbo. Farmer’s Market on Bainbridge Island. 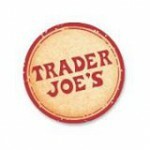 Trader Joe’s – The little grocery store with a big following is located in Silverdale – 35 minutes away. For me, so worth the drive. I go at lease once a month and stock my freezer and cabinets. Costco – Many people on the island trek over to Silverdale once a week for Costco. We are not those people (although we used to be- just not a lot of storage in our current home). If it is a must-do for your family it is available for you on the Kitsap side without having to take a ferry. Target – When I hit Trader Joe’s, I also make a stop at Target. Love shopping at Target for paper goods, household goods, the kids like their clothes and our Silverdale Target now has groceries too.